One thing I’ve learned from watching hundreds of makeup artists at work backstage: They are perfectionists. Sure, you could ask Van Gogh to draw you a stick figure, but he is not going to spend five minutes doing it. He may take 50 minutes or five hours. The same thing applies to makeup artists. Yes, the favored makeup artist of Kate Moss, Charlotte Tilbury, who wears a cat eye every day of her life, could spend two minutes drawing you the perfect cat eye. But if she’s really going to do it right, she will spend twenty minutes perfecting it on Karolina Kurkova and explain how to replicate it at home. 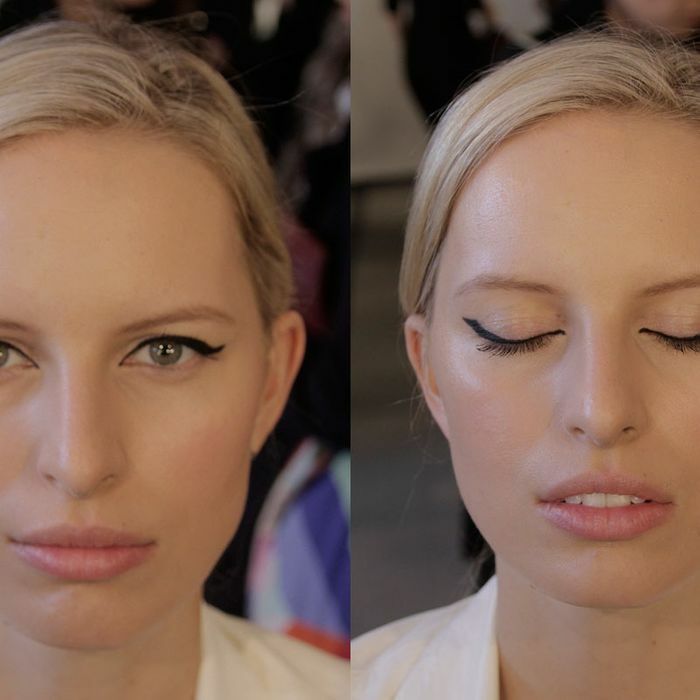 The Cut captured her tips via GIFs, as she explained how to do a “cowgirl” cat eye for Cushnie et Ochs. Step 1 - Because Cushnie featured a lot of cowboy hats in their collection, Tilbury dreamed up a “feline flick, that is a little more exaggerated, to have a cowgirl, rock n’ roll kind of feel.” Tilbury starts by using MAC Kohl Power Pencil in Feline and doing a line across the lash. Rather than drawing the line in one fluid motion, Tilbury uses a dashing technique. Step 2 - About three quarters of the way through the length of the eye, start pointing your line up. Tilbury filled in the triangle where the line ended. For people at home, she suggests putting a dot as a marker to signify where you want the cat eye to end, and then using that as a gauge to draw in the triangle. Step 3 - Pull part of the skin up so that it is taut enough to draw a line. Use a slanted Q-Tip dipped in moisturizing cream, using the slant to make the slash of the cat eye clear. Tilbury suggests doing this to get the perfect flick, and she prefers using cream because it’s cleaner (doesn’t leave any greasy residue) and isn’t as harsh on the skin as a makeup remover. Step 4 - Because a kohl pencil can be smudgy, for extra staying power, Tilbury used MAC Fluideline in Blacktrack to go over the line, using the initial pencil as a baseline. As with the pencil, she uses the dashing technique for the lashline. Step 5 - A straight line doesn’t mean a perfect cat eye. As seen in the GIF below, Tilbury exaggerates the triangle towardthe end of the lashline to account for depth and so the line doesn’t get “lost” in the eye fold.